I didn’t finish any of the fabric strips (that is, I didn’t clean up the rough edges), so there are little unraveling threads all over the place. This lends a rustic appearance, but I think I’d rather it look a little more finished. When I first started, I wasn’t sure how to sew it together. So I tried a method that was very frustrating, inefficient, and unattractive. That’s why there are all those black threads showing all over the place. I pulled too tightly in some places while sewing it together (this is also a result of the above issue), so the rug won’t lie flat. This is what annoys me most about this rug, and what prevents me from adding more braid to make it bigger. It’s small, but there’s not much point to making it bigger when it won’t lie flat. I think, though, that for a first attempt (especially since I had no help for most of it, except for some quick vague lines in Laura Ingalls Wilder!) it’s not bad. 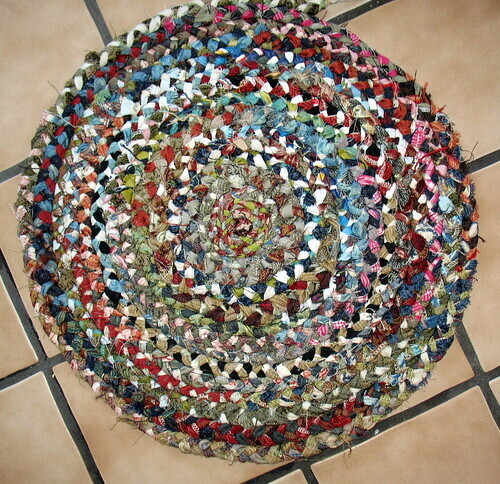 I’m looking forward to trying more and bigger rugs that are more finished and will lie flat!! 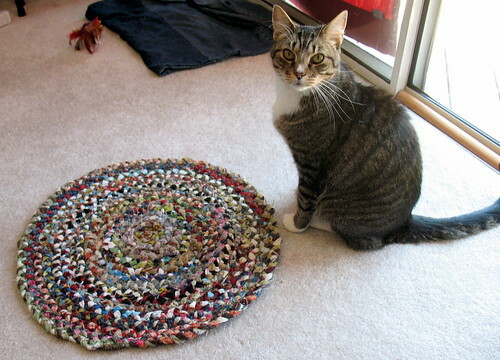 Yesterday, as predicted, I wasn’t able to get much done, though I did write some useful morning pages (laying out a conversation with Mommy so I can tell her what I’m up to) and worked some more on the rug.